It's the flu season. I'm quite desperate to increase my milk supply back to its normal volume because being sick causes my supply to drop precariously. Increasing fluid intake is almost a sure-fire way. Most mothers swear by green papaya soup. So, I cook a pot. 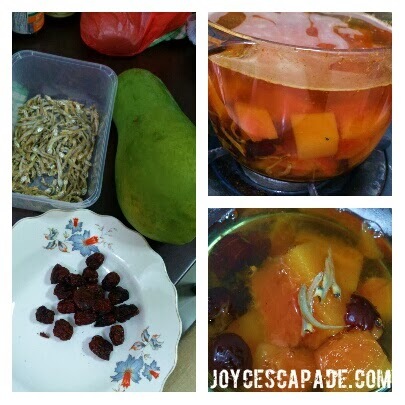 I cook my green papaya soup with anchovies and red dates. The green papaya flesh looks a bit too orangey but it's okay according to some mothers. Maybe I'll find a really green, green papaya (green flesh) next round. Also, it's better to cook with ikan kurau bones. Yup, will do so next round. Another good milk booster is red dates lactating tea. To all mama. Whether you are a full-time working mom, part-time working mom, stay-at-home mom, exclusive pumping mom, exclusive breastfeeding mom, partial breastfeeding mom, regardless of the condition of your breastfeeding journey, I just want to say, WE ARE AWESOME!